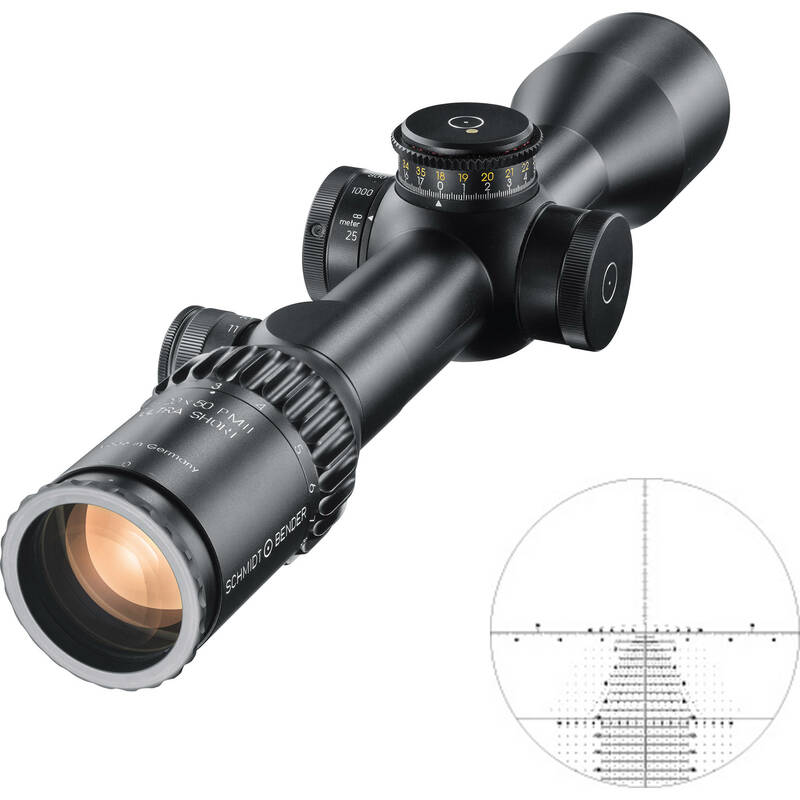 Designed for medium to long-range law enforcement and tactical and competitive shooting, the Schmidt & Bender 3-20x50 PM II Ultra-Short Riflescope is a compact optic that fits short rifles. It features a double-turn, counter-clockwise, More Tactile Clicks elevation turret; every tenth click is more pronounced to help you navigate the adjustment range. The 3-20x50 PM II Ultra Short is equipped with an illuminated TreMoR3 reticle in the first focal plane. The field of view at 100 yards ranges from a large 39' at 3x to 6' at 20x, and the generous objective lens maximizes available light for bright and detailed views of targets at distance, even in lower-light conditions. Along with the MTC elevation turret, adjustments include a side parallax adjustment dial and a capped, single-turn, locking windage turret with a zero stop. The scope's housing features a large 34mm one-piece maintube and is made of a lightweight aluminum alloy that has a scratch and corrosion-resistant RAL 8000 tan anodized finish. The housing is nitrogen-filled to provide fogproof performance in all weather and O-ring sealed to be waterproof to 9.8 feet.